Personalized Home Address Sign from Whitehall - - made in USA, using rust-free recycled aluminum and Alumi-Shield™ All Weather Coating that protects against the harshest weather and environmental elements and extends the sign's life and appearance. 18.5" x 7.75" oval shape Madison plaque holds up to five (5) 4.5" characters or up to seventeen (17) 1.25" characters -- all on one line. Please type the address exactly as you want it to appear in the Address input box above. Eleven color combinations (shown in small images from left to right): AB antique brass; AC antique copper; BG black plaque with gold characters; BS black plaque with silver characters; BW black plaque with white characters; GG dark green plaque with gold characters; OB oil-rubbed bronze; OG bronze gold; PS pewter silver; RG red plaque with gold characters; and WG white plaque with gold characters. 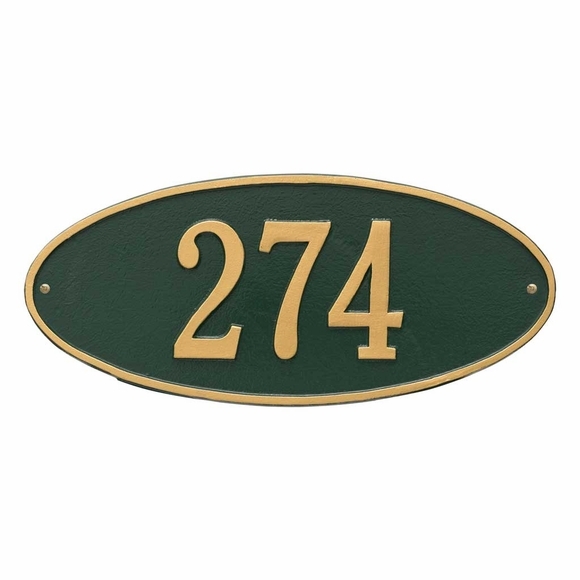 A 24.5" x 10.375" version of the Madison address plaque is also available -- see Related Products.